The TFA is a vital agreement to boost growth by cutting red tape at borders. Many companies – particularly SMEs – are currently held back from exporting due to burdensome, and sometimes unpredictable, customs requirements. A recent study by the OECD estimated that border inefficiencies currently add around 15% on average to the cost of trading internationally – placing a far higher burden on companies than many existing tariff barriers. 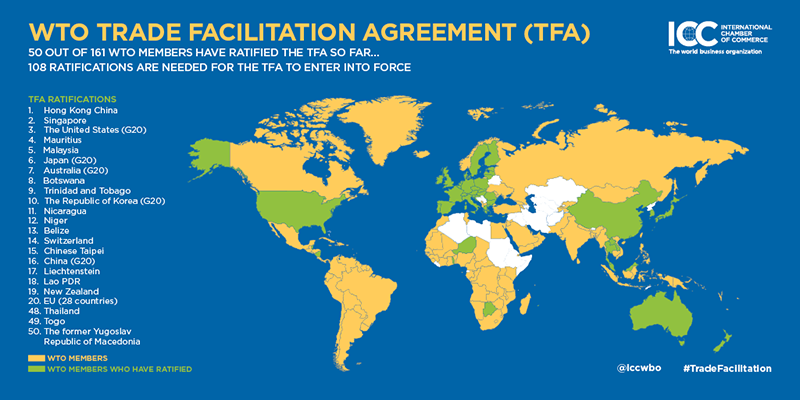 The 50th ratification of the agreement is an important milestone on the road to realizing the potential of the TFA to drive growth, opportunity and job creation. 108 countries – accounting for two thirds of the WTO’s 161 strong membership – must ratify the deal for it to enter into force. ICC is calling governments to expedite ratification of the agreement ahead of the WTO’s 10th Ministerial Conference, known as MC10, in Nairobi this December. Momentum is now clearly building on the TFA ahead of MC10. This is a vitally important deal to enable companies of all shapes and sizes to tap global markets. Implementing the agreement must be a core component of national efforts to boost competiveness and to enable job creation by the domestic private sector. The United Nations’ newly agreed Sustainable Development Goals (SDGs) place a key emphasis on trade as a driver of development. ICC has called on governments to implement the TFA as a “quick win” to deliver on the promise of the 2030 development agenda.